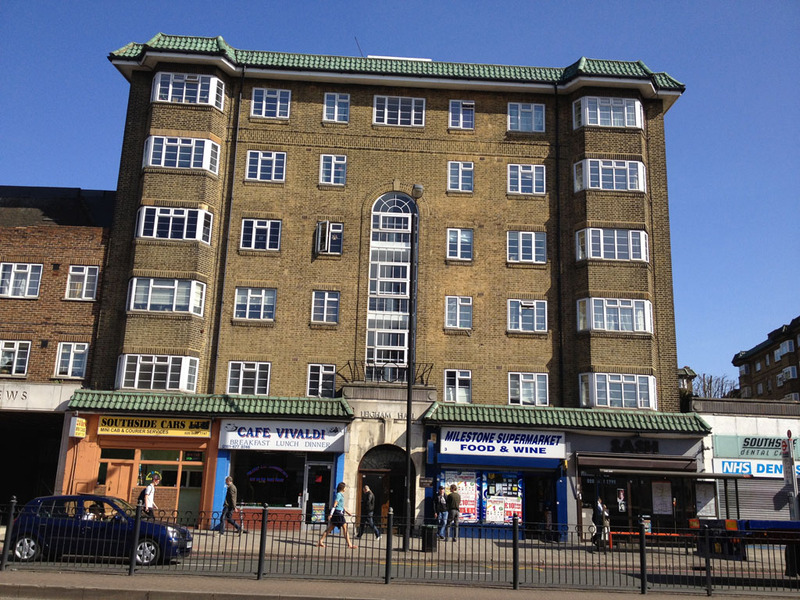 This pair of purpose built apartment blocks and street level shops, built circa 1936, was designed for the Bell Property Trust Ltd. Five floors of flats are accessed from street level through a number of original stylised front doors. The pairs of glazed front doors have arched fanlights over and decorative Art Deco, white painted metal work with gilded gazelles. Above the shops at first floor level there is a narrow strip of green glazed pantiled roof, which runs the entire length of the façade, the main roof is of green glazed pantiles also. The original sales brochure states that “these ‘Bell’ buildings exemplify superb value in modern living - with every luxury feature at remarkably low rentals. They are delightful examples of skilful planning, with amongst other features constant hot water, tiled bathrooms, uniformed porters, electric lifts and separate tradesmen’s entrance.” In addition to these attractions the developers also wooed tenants with social facilities, a swimming pool, and a residents club for billiards, table tennis and dancing.